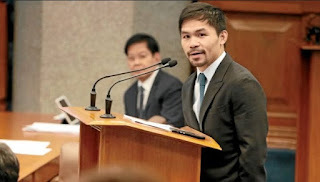 World boxing icon and Senator Manny Pacquiao took a jab at Senator Leila de Lima for seemingly defending witness Edgar Matobato during the Senate inquiry on drug-related killings Thursday. “What I understand, Mr. Chairman dito, ito ay inquiry sa isang witness para pakinggan natin yung statement ng witness. Hindi natin dedepensahan siya kung hindi i-examine kung nagsasabi siya ng totoo,” Pacquiao said, addressing Senator Richard Gordon, chair of the Senate justice committee. “Tayong mga senador nagi-imbestiga, hindi magpo-proktekta sa witness. ‘Yun po ang rules natin dito,” Pacquiao added. The neophyte senator butted in during the hearing after De Lima appealed to his colleagues not to “mislead” Matobato when they ask their questions. “I go back to my appeal earlier, iwasan po natin misleading. Kapag naman po siguro meron siyang ine-explain, hayaan naman po siya para maka-explain,” De Lima said. Matobato faced, for the second time, the Senate panel to testify on alleged killings he committed supposedly on President Rodrigo Duterte’s orders when Duterte was mayor of Davao City. 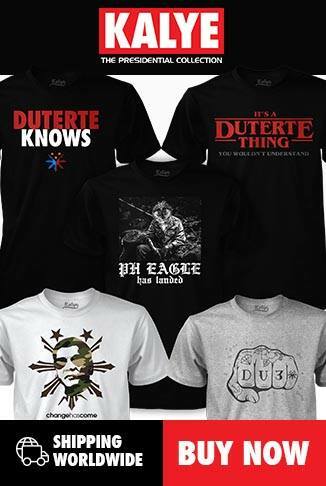 Matobato is a confessed hitman and member of the so-called Davao Death Squad. It was De Lima who presented Matobato to the Senate body after he sent an emissary to the senator expressing his willingness to testify in the ongoing inquiry. Days after Matobato was presented to the Senate panel, De Lima was voted out of her position as committee chair upon the motion of Pacquiao in a plenary session. Gordon, meanwhile, also took offense on De Lima’s statements, refuting any attempt to mislead the witness. “I would normally say I resent that remark.. but you’re a lady. I will always respect you as lady. There's no attempt on the part of this representation and I believe people seated on this desk here have any attempt to mislead," Gordon said.